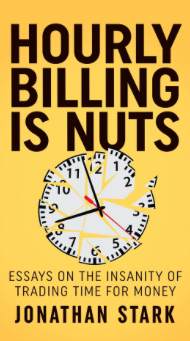 I f you are working for yourself by the hour than “Hourly Billing is Nuts” is the perfect read for you. Author, and fellow solider in the trenches of service providers, Jonathan Stark has written an easy to read primer on why trading your time for money is insanity. Stark’s personal experience getting out of the hourly billing trap sets the stage for lessons you can start applying to your business. He offers an alternative which is foreign to many soft service providers at every level; value pricing. Value pricing means determining what the work you are doing is worth to you (Cost) and how much your client will pay for the outcome (Value). As you utilize this pricing model you can turn a profit for yourself and your client. Summary: I highly recommend this book and its author. Inside are valuable insights for thinking about pricing any product or service.